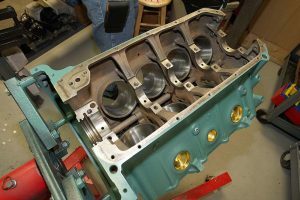 Identifying a classic Buick "Nailhead" engine is easy because of the vertical valve covers. The engines don't typically make a ton of power, at least in stock form, but they doo have a lot of cool factor for hot rodders because they are relatively rare and look neat. Buick first began producing the Nailhead in 1953, and production continued all the way until '66. 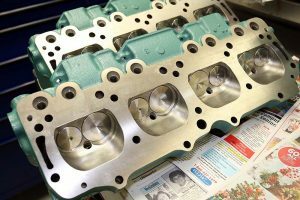 The engine family got its name because of the narrow valves extending from the top of the cylinder heads vertically to look like nails. The engines varied from as small as 264 cubic inches (rated at just 143 horsepower) all the way up to a 425 with 340 horsepower and 465 lb/ft of torque. 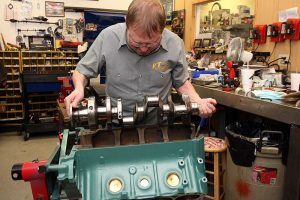 We swung by the shop of KT Engine Development in Concord, NC, as they were ripping into this '63 Nailhead that is destined to go into a '32 Five Window Coupe build. 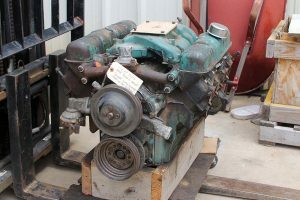 This is a 401 engine, which was build from 1959 through '66. Equipped with a single four-barrel carb, the engine was rated at a very pedestrian 265 horsepower. 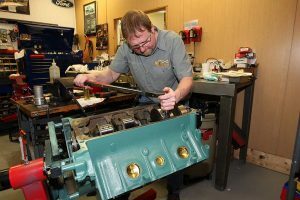 After the rebuild and a few modifications, engine builder Ken Troutman was able to coax 347 horsepower and 452 lb/ft of torque out of the engine -- all while maintaining the original look. Check it out for yourself in the photos below. 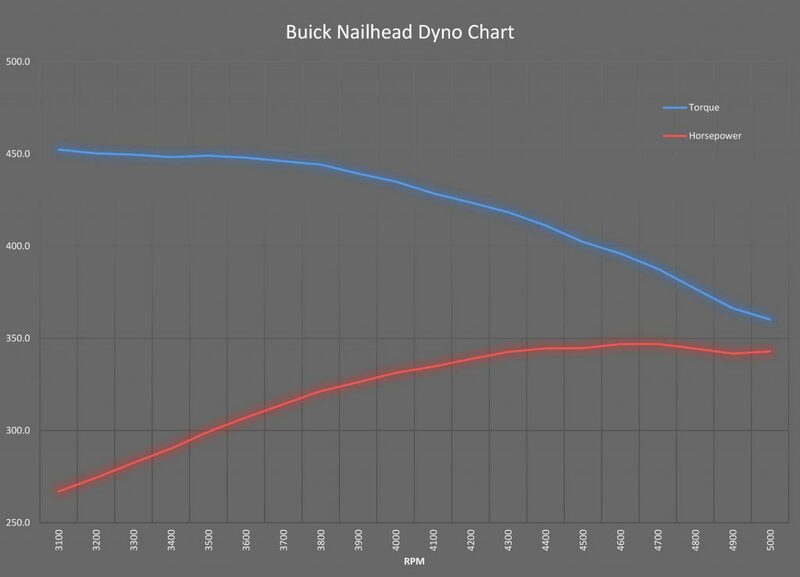 And don't forget to see and hear the old Nailhead on the dyno in the video at the top of this post! The crusty engine as it arrived at KT Engine Development. 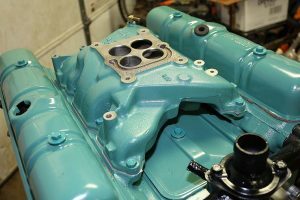 Things are looking much better after the engine block has been remachined and painted. Notice that the cylinder numbers have been marked on the block. 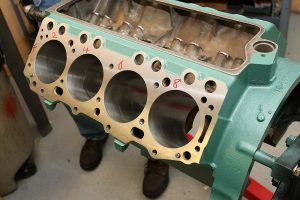 The number-one cylinder is actually on the right-hand side (the opposite bank on this photo), which is opposite what you may be used to if you are accustomed to working on small block Chevys. Here's a look at the bottom side of the block. 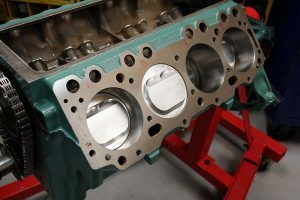 A unique feature of this block is it actually has an oil gallery "tube" cast into the block between the crank saddles and the camshaft. The camshaft is a hydraulic flat tappet piece from Comp Cams. It is ground with 224/230 degrees of duration at 0.050-inch lift with 112 degrees of separation. Gross valve lift will be 0.471 inches for the intakes and 0.474 for the exhausts. Here, the lobes are coated with Driven Racing Oil's assembly grease to protect the lobes during break-in. 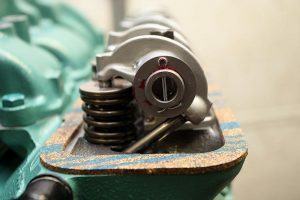 The original crankshaft is forged, so it will be reused. Stroke is 3.640 inches. The main journals are 2.498 inches while the rod journals are 2.249. Ken Troutman torques the main caps to 100 pounds. Unfortunately, while the block does have a deep oil pan skirt, the main caps aren't cross bolted like a classic Hemi or a modern LS. 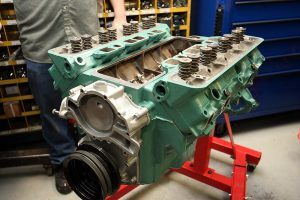 This costs the bottom end some strength and rigidity, but unless you are making some serious modifications this engine doesn't typically make enough power to need it. 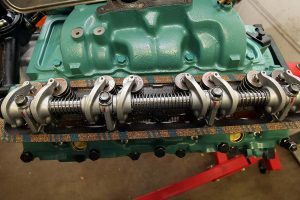 The connecting rods are the original Nailhead units. 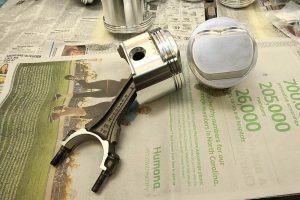 Connected to them are a set of custom JE forged pistons. Notice the incredibly tall 1.941-inch compression distance necessary to work with the Nailhead's awkward combustion chambers. And here they are installed in the block. Combined with the 3.640-inch stroke, the 4.200-inch bores (punched out from 4.188) now combine to make total displacement around 403 cubic inches. Notice the extreme valve angles in the cylinder heads. 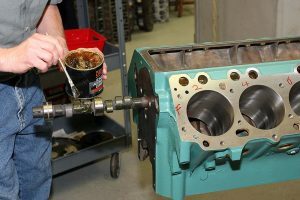 This is why it is necessary to use the domes you saw in the pistons in order to create a reasonable amount of compression ratio. Here, you can see how the heads orient the springs so that they are vertical. A separate front cover encloses the timing gear and integrates the water pump, much like a Ford Windsor. These are the stock-style rocker arms. The shaft system helps secure the spindly rockers to help improve valve control. Notice the crazy pushrod angle required to make the rockers work with the vertical valves. KT Engines reused to dual-plane, four barrel intake. 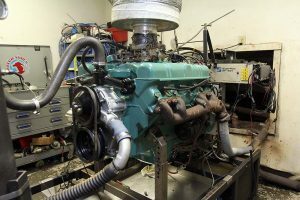 On the engine dyno, this classic Nailhead ran smooth and made a respectable 347 horsepower and 452.4 lb/ft of torque. Would you be interested in some pics of the final install? She's done.